The 2017 Jaguar F-Type SVR. Publisher's note: Normally, the cars you read about here at TireKicker are loaned to us by the press fleets of the various manufacturers for several days. Seven is typical. Occasionally, we'll get a longer period of time, and sometimes it'll only be three or four days. Our "30 Minutes With" series are cars that we spent half an hour behind the wheel of during the just-concluded Western Automotive Journalists Media Days in Monterey, California. Day one of Media Days is a driving program, with journalists taking cars from the staging area at Quail Lodge in Carmel Valley to Mazda Raceway Laguna Seca via Laureles Grade. Once there, you swap cars with another journalist for the drive back, and then swap cars again once back at the Quail. Apart from an hour's lunch, this is your day from 9:00 a.m. to 4:00 p.m. Each run is about half an hour, and driving 10 to 12 cars back-to-back-to-back gives you interesting points of reference about the next one. My sixth car of the day was something I frankly wasn't expecting. Pre-recession, Jaguars were fairly common in press fleets and I'd drive a few a year. Smaller publications like TireKicker fell off their radar when times got bad. In the seven and a half years since I last drove a Jaguar convertible, much has changed. Namely, the level of ferocity. In 2009, Jag was building fast, comfy droptops. The 2017 Jaguar F-Type SVR is much, much more than that. Quail Lodge to Mazda Raceway Laguna Seca via Laureles Grade (courtesy Google Maps). Laureles Grade is about five and a half miles of non-stop twists and turns between Carmel Valley Road and CA 68, and thus perfect for a pack of automotive journalists and some high-grade machinery. The 2017 Jaguar F-Type SVR is, without a doubt, the highest-grade machinery I drove all that day. Make that all this year. Possibly all this decade. The first clue came when I made the right turn onto Carmel Valley Road when leaving the Quail en route to Mazda Raceway Laguna Seca. I gave it about one-third throttle and immediately and literally held onto my hat...which I then tucked between the driver's seat and the console for safekeeping. In 45 years as a licensed driver, I've heard a lot of sounds come out of the cars I've driven. And in 20 years as a professional TireKicker, I've driven some serious performance vehicles. 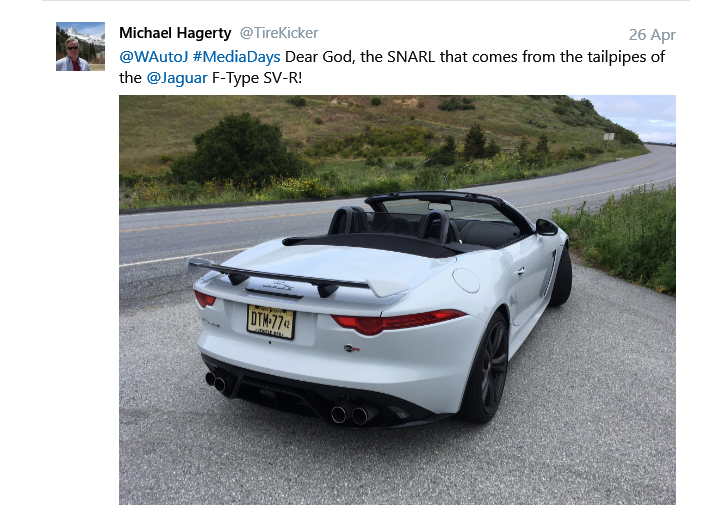 Nothing....NOTHING sounds like the 2017 Jaguar F-Type SVR. It's like there's a live and very angry jaguar under the hood and he's got the amplifiers and speakers from the last Who concert in there with him. And this is not a car that makes noise instead of speed. According to Jaguar, the F-Type SVR does 0-60 in 3.5 seconds. The top speed is 195 miles per hour, reduced to 186 for cars fitted with the deployable rear spoiler, as this one was. If you miss that nine miles per hour, you're far braver than I. And somehow, despite the cylinders and the size and the power, the F-Type SVR still gets an EPA highway fuel economy estimate of 23 miles per gallon. Beyond that, the handling is race-car sharp. This is the stuff legends are made of. 2017 Jaguar F-Type SVR interior. The cockpit? Top-notch and no nonsense. Everything exactly where it ought to be. As with all the cars we drove, there was no window sticker, so it's off to Jaguar's website and the "build it" feature for a rough guess as to equipment and cost. We'll start with the big number. The base price. The black wheels cost $1,000. The red brake calipers are standard. Opt for the yellow carbon ceramic brake package and it will cost an additional $12,000. The good news is that, as near as I can tell, that's it. So $128,800 plus the $1,000 for the black wheels. $129,800, which appears to include destination and delivery. I can't believe I'm about to say this, but...it's a bargain. This side of $130,000 for this much power, capability and sheer driving excitement? A lot of people are paying a lot more for performance cars and not getting that much more for their money. I'm sure I never will, but I'd love to have one.